This Roman Troopers Helmet full sized and wearable Roman Helm. 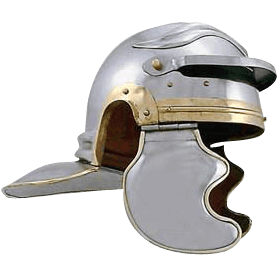 The Roman Troopers Helmet is hand crafted in the style worn by the Legionary Roman infantry troops who marched across Europe from 100 to 299 A.D. The brass accents and piping portray the Gallic influences of armourers at this time, extremely evident is the embossed eyebrows at the top of the skull. An example of this is found on an iron helmet found in Brigetio, Hungary dating to the first half of the 2nd century. 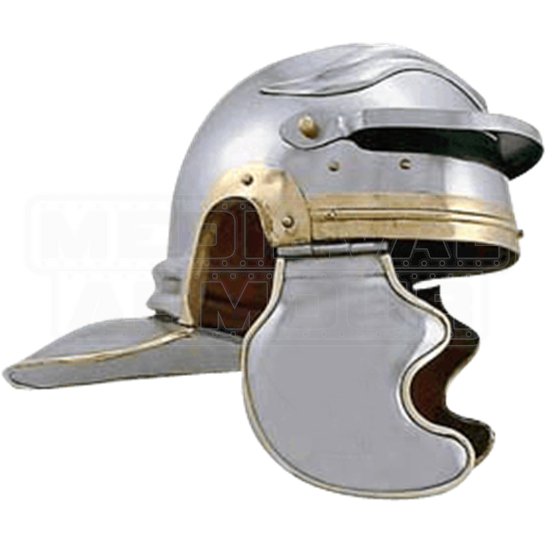 The Roman Troopers Helm is a wonderful and historical helm beautifully crafted in 18 gauge steel.